nutritionally and functionally balanced foods and treats." The Lapdogs' tails are always wagging when it comes time to review new treats and there was no exception to that rule when a bag of Spring Naturals Turkey Treats showed up at our door! Spring Naturals are made with real meat, whole vegetables, whole fruits and whole grains. They contain no wheat, gluten, corn, soy or by-products, nor any artificial preservatives, flavors or coloring. Made in the USA, Spring Naturals are truly wholesome goodness that both you and your dog will love. Spring Naturals baked treats are currently available in both wholesome grain and grain-free options and in four flavors; Beef, Chicken & Lamb, Turkey & Salmon and the one we received for review, Turkey. The first thing I did was read the ingredients listed on the package: turkey, apples, molasses, natural flavor, chickpeas, salt, spinach, quinoa, oats, blueberries, cranberries, flaxseed, rosemary extract, apricots, dandelion greens, calcium propionate, zinc propionate. My first thought was "yum... sounds delish, are these really for the dogs?" Then I opened the package and was pleasantly surprised to find such an appetizing odor. 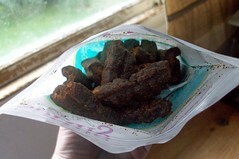 Unlike many other meat based treats, Spring Naturals Turkey Treats have a very pleasant, almost fruity smell to them. The Lapdogs seemed to agree with Mama... they sat, drooled and did tricks for Spring Naturals! Even my finicky eater Zeus gobbled one up right away... there was no sniffing or investigating before hand, which is when I know treats must smell as delish to him as they do me! Spring Naturals also makes a line of dry and canned dog foods, which, like their treats, are available in wholesome grain and grain-free options. Additionally, organic options are also available. Spring Naturals Turkey Treats have received the official 16 Paws Up Lapdog Seal of Approval! Grab some for your pack today -- Zeus promises they won't be disappointed! 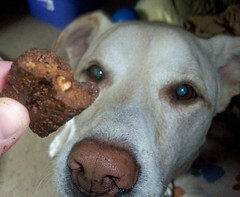 Disclosure: Lapdog Creations received the Spring Naturals treats free of charge for review. I was not compensated for this review and all opinions expressed are my own..
Wow treat tester , what a job! Where do I apply. Those sound fantastic! We're always looking for great treats here at Casa de Kolchak - we'll have to check them out! Thanks for sharing them! Nice to know they smell good. I hate opening a package of treats and getting that first sniff of awful smell. The dogs seem to like stinky treats but I could do without.